This level of direct control puts it comfortably ahead of Sony’s a6000 and a6300, and more on par with Panasonic’s GX85 (GX80 in some markets) and GX8 enthusiast models. All of these cameras aim to offer stills and video capabilities in relatively small bodies but with a reasonable level of direct external control. The Canon EOS M5 is a very approachable camera, despite all those buttons and dials. In fact, it’s the implementation of this touchscreen that, in general, we’re most impressed with. Much like the system developed by Panasonic, the M5 not only lets you use the rear touchscreen to position focus, it also allows its use as a touchpad to move the focus point when you’re shooting through the viewfinder. This, combined with decisive autofocus, has proven to be significant for both stills and video shooting. The camera has four dials in total: two main dials on the top of the camera, a dedicated exposure compensation dial and a fourth dial encircling the four-way controller on the back of the camera. 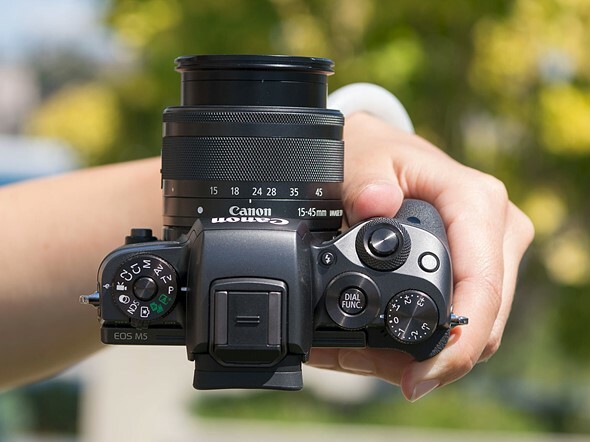 This is a much higher level of direct control than offered on the simpler EOS M-series models offered previously, suggesting Canon expects the user to take more hands-on control of the shooting experience. Three of the four control dials on the M5 are on the top plate, giving users easy access to exposure parameters. While the lack of 4K video capability is a disappointment, the ability to use the touchscreen to re-position the focus point with a high level of confidence that the camera will smoothly glide the focus to the right point is highly desirable. The touchscreen-plus-Dual-Pixel-AF combination is also useful for stills shooting – you can not only use the touchscreen to drag the focus point around the screen but also use it to select between available faces if shooting or recording in face detection mode. The other significant benefit of the M5 finally receiving Canon’s Dual Pixel AF system is that it is now able to focus adapted EF and EF-S lenses very effectively – overall performance isn’t quite the same as an 80D in Live View mode, but it’s leaps and bounds ahead of any previous M camera. 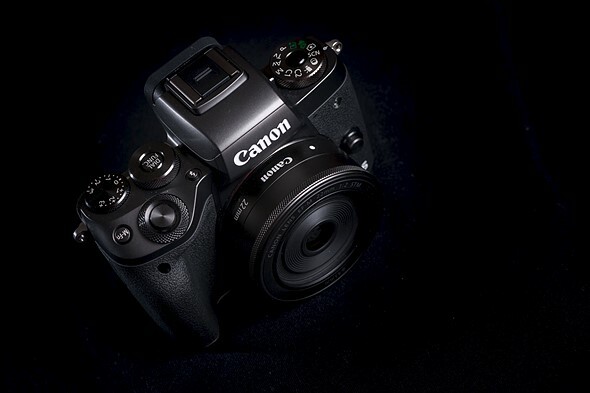 You’re also no longer limited to the small central focus area offered when using comparable Rebel / EOS x-hundredD DSLR models, and focusing is almost DSLR-quick and decisive. The enthusiast photographer has a good number of choices when looking for a reasonably sized mirrorless camera with a good degree of direct controls. Sony offers the a6000 and a6300 (the higher-specced a6500 comes in at a significant premium over the EOS M5), depending on how much you need 4K video and how demanding your AF needs are. Meanwhile, Panasonic offers both the GX85 and GX8, with the more expensive model offering higher resolution and a better viewfinder. Olympus’s E-M5 Mark II offers a broadly similar feature set and form factor. All of these models are extremely capable, with ease-of-use being the Canon’s most obvious response to their broadly higher video specifications. * When using Panasonic-branded lenses the GX8 adds distance prediction based on the out-of-focus characteristics of the lens (A system the company calls ‘Depth From Defocus’). So, is the EOS M5 the mirrorless tour de force we’ve been expecting from Canon? It’s no secret that we found it to be an incredibly promising camera, even if it is a bit late to the party. To find out just how compelling an option the M5 is, let’s press on.